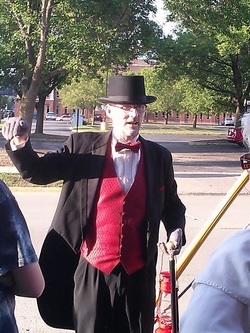 Come stroll with published author of "Haunted Green Bay"
Tim Freiss as he tells legendary stories of scandals, ghostly encounters and local history that has made the City of Green Bay what it is today. On this one an a half hour to two long tour you will hear the history of Green Bay's downtown district and the frightening activity that haunts those buildings still to this day. We are able to enter a couple of the buildings with Emf detectors. This family friendly tour is sure to amaze, entertain and possibly even teach you something about Green Bay you never knew before. See tour schedule or click on book tour button below for dates. If you would like to attend the Green Bay walking tour, click on the button below to book a tour. You may email us at info@greenbayghosttours.com, or call us at 920 499-2783 Call between the hours of 9.00 am and 9.00 pm. Please leave a message and we will get back to you as soon as we can.